Botany science and solar array photography were on the Expedition 57 crew’s schedule today including ongoing maintenance of the orbital lab. The research and photo surveys help scientists and engineers understand how life and International Space Station systems adapt to microgravity. Astronaut Serena Auñón-Chancellor is helping NASA and its international partners understand how plants grow in microgravity to promote humans living longer and farther in space. She set up the Veggie plant growth facility today to grow a variety of edible plants such as kale and lettuce inside Europe’s Columbus lab module. Botanists are also exploring how cultivating plants to provide a fresh food supply affects crew morale. Commander Alexander Gerst started his day familiarizing himself with the botany experiment. 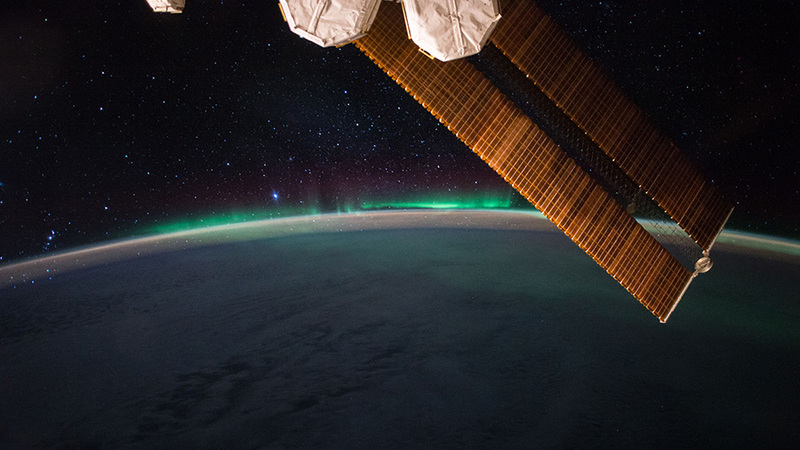 The German astronaut from of ESA (European Space Agency) then worked throughout the day photo-documenting the station’s port side solar arrays. The photos will be downloaded so ground specialists can inspect the condition of the arrays for damage sites. On the Russian side of the space lab, cosmonaut Sergey Prokopyev checked on power supply systems inside the Zarya cargo module before moving on to science and life support work. Zarya was the first station module launched into space and will reach its 20th anniversary on Nov. 20. Please visit… https://spotthestation.nasa.gov and enter your location for space station sighting times.